Scotland is rightly proud of its wonderful natural larder and those who produce mouth-watering creations. 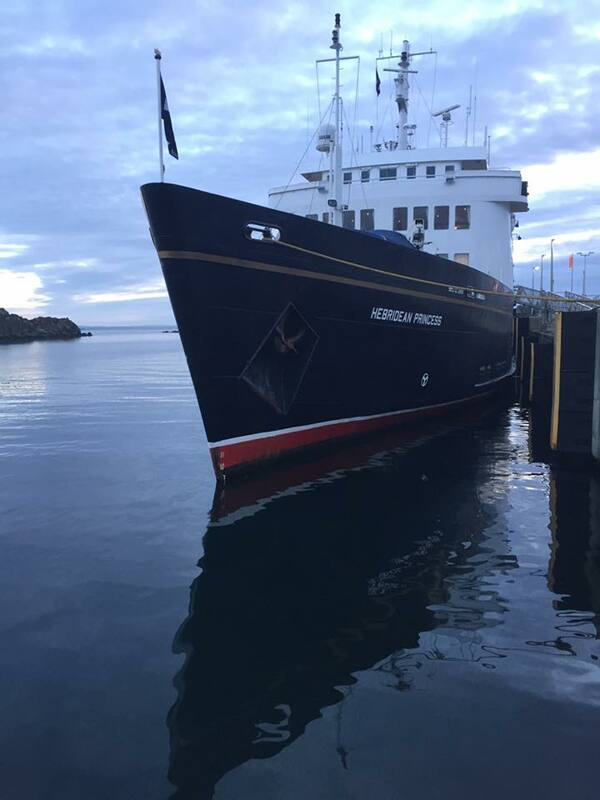 Join Hebridean Princess as we explore the wonderful culinary offerings of the Highlands and Islands. At the end of this gastronomic tour of the Hebrides, our Captain, officers and crew waved a fond farewell to guests disembarking in Oban this morning. Our final morning was spent cruising on passage towards the Isle of Eriska, where guests sampled the culinary delights of the Michelin-starred Isle of Eriska Hotel for lunch. We concluded our culinary voyage with a visit to Duart Castle for a Champagne Reception hosted by Sir Lachlan MacLean. Our Farewell Gala Dinner was held at anchor off Java Point in the Sound of Mull. On the Isle of Colonsay this morning guests travelled to the village hall for a tasting of Colonsay Oysters and Honey with Andrew Abrahams who supplies the ship. Returning to the ship for lunch we sailed to Port Ellen, Islay, for a tour of Kilchoman Distillery. We spent the night at anchor in Loch Coalisport. After a morning spent cruising on passage towards Loch Dunvegan, guests were tendered ashore for lunch at The Three Chimneys. An afternoon visit to Dunvegan Castle and Gardens was also available before we set sail once more on passage towards our overnight anchorage in Loch Tuath off the Isles of Mull and Ulva. From our berth in Kyle of Lochalsh guests travelled to the Michelin-starred Kinloch Lodge for a cookery demonstration with Chef Director Marcello Tully followed by a seafood buffet lunch. During the afternoon a visit to Eilean Donan Castle was enjoyed. We anchored overnight just south of Kyle Rhona. It was a beautiful autumn morning in Shieldaig where our guide Andrea took some guests on a walk around the conservation village whilst others enjoyed refreshments at Nanny’s tearooms. Some guests also enjoyed speed boat rides with Steve Grant, 3rd Officer. During lunch we cruised to Gairloch for our afternoon visit to Inverewe House and Garden where gorgeous autumn colours were on display. We anchored overnight tonight off the Isle of Raasay. A morning call at Tobermory allowed guests to visit the Isle of Mull Cheese Farm for a tour and to learn of the traditional methods employed here and to sample the hand made cheeses. As guests returned for lunch, a pod of dolphins were frolicking around the ship. A blue sky afternoon was spent cruising past the Small Isles, along the Sound of Sleat, Kyle Rhea and under the Skye Bridge on passage towards our overnight anchorage off Applecross. 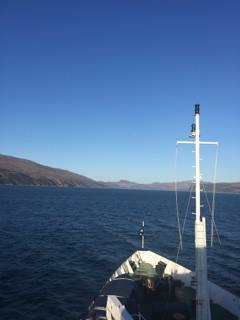 Guests embarked in Oban today before we set sail on our culinary voyage to our overnight anchorage in Loch Sunart.